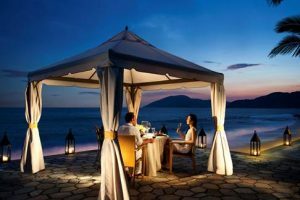 Top honeymoon destination, Mandarin Oriental, Sanya has launched its Art of Romance accommodation package for couples seeking a romantic getaway. Built with privacy in mind to ensure a peaceful and relaxing stay, the resort has elegant guestrooms with beautiful sunset views, making it an ideal lovers’ retreat. As part of the Art of Romance package, couples can enjoy a candlelit dinner on the beach, where they can listen to the waves while they savour the resort’s creative cuisine. A relaxing spa visit is among the many other pleasures that await them at the resort. The Art of Romance offer is subject to 15% service charge, and a minimum two nights stay is required. The offer is valid until 23 December 2016, and is subject to availability. Terms and conditions apply.